CHESTNUT HILL, Mass. - Ryan Dmowski's one-timer early in the third period broke a 1-1 tie and UMass Lowell added an empty-netter in the final minute to seal a 3-1 Hockey East victory over Boston College at Kelley Rink. The Eagles fell to 8-4-2 in the league and 8-12-2 overall, while the River Hawks (14-8-1, 8-4-1 HEA) won their sixth straight game and pulled to within one point of BC. Reid Stefanson had the lone goal in a choppy first period, finding the top left corner from the left wing on Lowell's first power play. The Eagles fired 13 of their 25 shots on goal in the second period and found an equalizer late in the frame through a weak-angle shot from rookie Jack McBain. A Boston College turnover five minutes into the third proved costly when Dmowski hammered a one-timer back across the face of goal for the eventual game-winner. BC pulled Joseph Woll (20 saves) for an extra skater with 1:23 remaining on the clock and UMass Lowell called its timeout. With 30 seconds remaining, Stefanson skated onto a clear from Ryan Lohin to put the game away. Tyler Wall made 24 saves in the UMass Lowell net to pick up the victory. 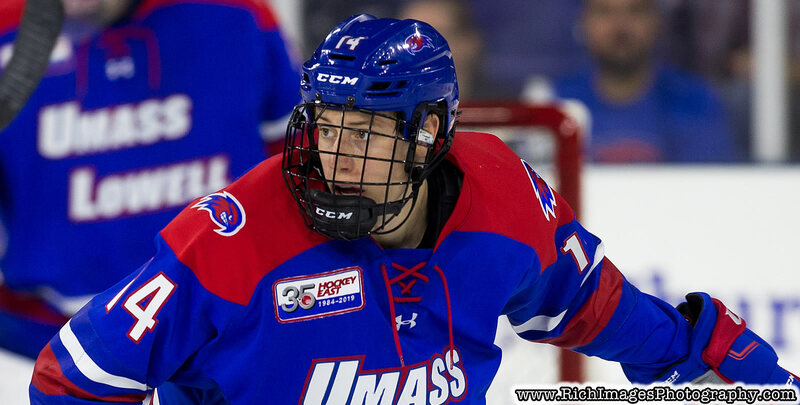 Boston College and UMass Lowell complete their home-and-home series on Saturday (Jan. 26) at Tsongas Center. The game will air live on NESN at 7 p.m.